As with any investment, your pool needs a little TLC to maintain its high-performance record. Hucks Pool Company, Inc. can help you establish a seasonal and regional care plan, but most pools follow a basic maintenance calendar. Shock your pool in the evening. Shocking restores your pool water, killing germs and destroying any organic contaminants. Be sure to follow the label instructions. The next morning, add a maintenance dose of algaecide. Monitor and maintain chlorine levels at 1.0-3.0 ppm. Empty skimmer baskets, skim leaves, insects and other debris from the pool surface. Clean the pool wall tiles at the water line. 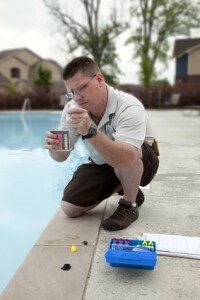 Bring your water sample to Hucks Pool Company Inc. for a complete professional water analysis. Be sure to test the alkalinity, calcium hardness and stabilizer levels. Your pool water should be tested two to three times a week. Keeping track of your water balance will create an optimum swim environment for you and your guests and ensure a long life for your pool. All water samples should be collected from the deep end of your pool. Roll up your sleeves and reach down to elbow length for the best sample – around 18 inches. A usable sample should include 8 ounces of water – trapped in a sample bottle or any clean, plastic container. Carolina Water Features, Inc. is the trailblazer when it comes to commercial water park attractions. We are an innovator of waterplay technologies. Our water features are hand painted so that no two products are exactly alike. White Lake Water Park, White Lake, NC Take a ride on the 50 ft tall 210 ft long double Turbo Twister Slide or take a plunge in our brand new 2,000 square foot swimming pool. Hucks Pool Company has been serving North Carolina and South Carolina since 1963 designing and building residential and commercial swimming pools, spas and water features. With over 45 years experience you can count on our expertise when designing and building your pool whether it be for your backyard or a commercial or municipalities project.